The Seattle-based startup, which used multi-level marketing tactics to win customers for its mobile phone service, announced that it will shut down the company on Dec. 4. According to an email to the Solavei network marketing distributors, the company closes down effective December 4th at 5:00pm PT, All Solavei Mobile Service will cease for the members. “Yesterday was one of the most difficult days of my career. When I first had the vision for Solavei, it was founded on two core values: To do business with people I like, love and trust and to positively impact millions of peoples lives. Over the last three years over 400,000 people said “Yes” to Solavei, where we helped them save over $120 million from what they had previously paid for their mobile service. We were also able to pay over $35 million to our members for passionately sharing Solavei with those closest to them. We have seen so many lives touched by Solavei and yet, we have faced many challenges in the process of doing what has never been done before in a highly competitive market. Although we have had to make many changes in the process of adjusting to market shifts and business pressures, we never stopped focusing on our members and doing our best to create a path of success for them and their families. I can truly say that I’ve been rewarded beyond measure to have worked with each of you, all of you are friends that I like, love and trust. Solavei was created to be a social commerce platform for primary goods and services. The vision was to start with mobile service, something everyone needs and wants, and then move into other goods and services with the hope of driving down the cost of commerce in the home and making it profitable for families who participate. Since our exit from the reorganization process in August, we’ve been focused on a strategy that would enable us to offer mobile service to our members without having to take on the overhead and customer support roles that are required to manage a mobile network. Unfortunately, this plan, which required some financial changes, was not supported by our mobile operator partner. We made every effort to have our Solavei member’s service and compensation protected, but even with multiple requests, our mobile operator partner would not support the plan. It saddens me to have to inform all of you that effective December 4th at 5:00pm PT all Solavei Mobile Service will cease for our members. T-Mobile will be sending out new SIM cards today and will be providing one month of mobile service along with $10 off any prepaid plan for six months for those who want to use their network. Due to these changes, we will not be offering Callie’s Coffee to our members as originally planned. We deeply believe in the mission of Callie’s and their focus of providing funding to cure childhood cancer. It has been exciting to see the thousands of people excited about Callie’s. We know Callie’s has been enthused to launch with Solavei and they believed in the power of our members and their social connections. Because of this, they are planning to launch their own social referral program in the coming weeks. We encourage you to go directly to Callie’s to support them and help spread the word. All of these things combined have caused great challenge to Solavei’s ability to move forward as a company. As a result, effective December 4th, we have no choice but to discontinue our operations. We realize that there are many people impacted with this announcement, including our members, our employees, our investors, and our business partners. My hope and prayer is that the relationship with Solavei has provided a positive impact, in some way, over the last three years. Moving forward, I want to personally say that there are many of you that I have come into strong relationship with who have placed their confidence and trust in my leadership. I want you to know that I am still passionately focused on the vision of building a great future together that will continue to bring value and benefit to your families. I have found in life that even the toughest storms prepare us for greater victories to come in the future. I am hopeful that each of you will emerge from this moment stronger than ever in the days to come. I want to thank you all for being with me and the entire leadership team, arm-in-arm, as we have worked tirelessly to positively impact people’s lives. You have personified the words “Powered By Relationships”! 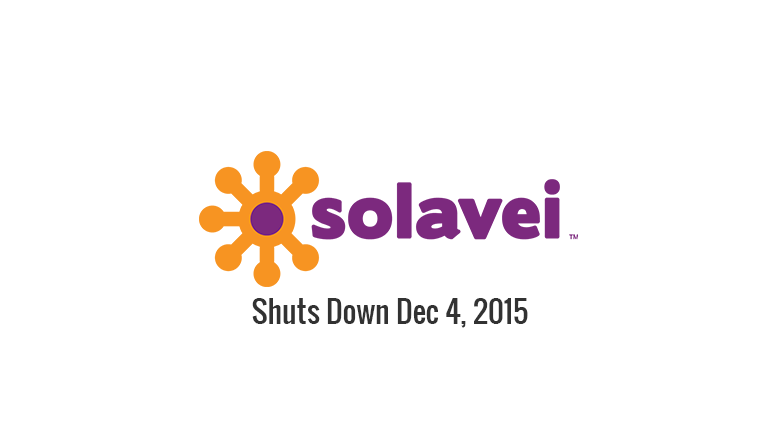 Be the first to comment on "Solavei Shuts Down Due To “Competitive Landscape”"